We’ll break our 15-week +Finals course up into 3-10-3 weeks. Each of the 3 activities will be a separate document you deliver via BeachBoard’s Dropbox by 11:59 pm on Sunday night. Work is due by 11:59 pm on Sunday nights. No late work is accepted. Please read the Cheating & Plagiarism section of the CSULB Catalog. Your work should be yours. If you plagiarize in this course I will report you to the Chair of your Department, and the Dean of your CSULB College. Please do not turn in old work. This course consists of a series of activities to do now in the context of this class and in resonance with your classmates. 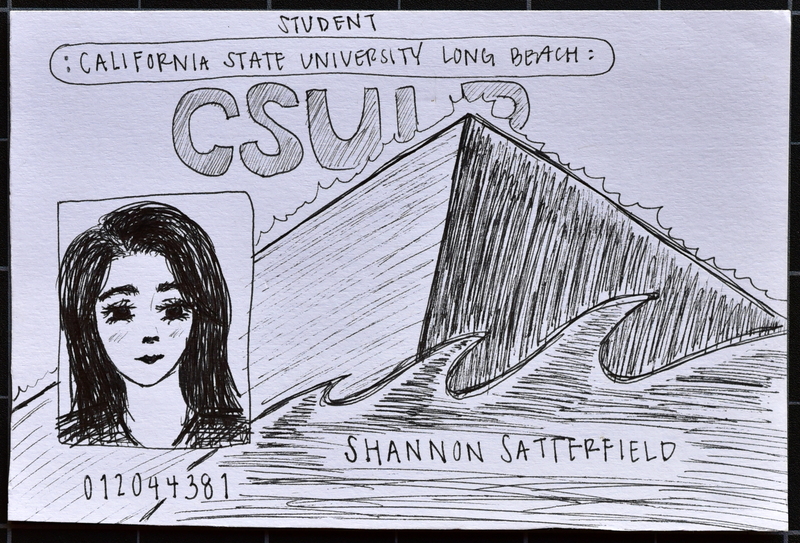 Please “draw your ID card” on a 4×6 index card and turn one in at the end of every class. Because Art 110 is a large class with about 130 students, it is difficult to give detailed feedback on your writing. I’m happy to discuss your writing at any time and to help you develop better ideas and better form. To help with a quick understanding of your work, we will grade with Coded Points. Analytic: in writing about artists’ work, terms like “Like it” and “Don’t like it” are not generally helpful. As a university student your job is to analyze ideas, art, artists, culture, and communication. Try to discuss how this work resonates with other artists. With art historical ideas. With your own life experiences. Try to think deeply about the work. Consider it in a wider context. Please use separate files for each item each week! Art Galleries are the opposite. Sometimes people feel like they’re supposed to be quiet, but actually, there’s no such “rule”. Talk! Discuss! Interact! Make the space and the experience yours! On the other hand, in Art Galleries and Museums, PLEASE DO NOT TOUCH! The majority of work you will see should not be touched. CSULB will make reasonable accommodations for any student who has a disability. It is the student’s responsibility to notify me in advance of the need for special accommodations. This course uses many activities and many tools. Most of you should have no trouble with any of this, however, if anyone has challenges with any course aspect for any reason, please be in touch ASAP and we can work to find suitable alternatives. A sincere effort should result in real learning and a good grade, so never be afraid to ask for any accommodations you need, but do make a sincere effort.